I finished my last class of culinary school today, and brought home 6 pounds of mussels! My boyfriend questioned my excitement over the classes, and said he was surprised that I wasn’t as excited about them as he thought I would be. I reflected on that, and I can see where he’s coming from. It’s a mix of factors really: the time – 1pm to 5pm (smack in the middle of the day), the fact that it took up all my weekends in July and August, the food was healthy – and while I support that (as seen by my Cobourg adventure), sometimes butter is nice. Nevertheless, I learned a lot and I definitely think I’m a better chef (despite my brother’s opinion). I no longer use steak knives as my primary tool – I use my chef’s knife, (thankyouverymuch), and have tried many new foods – tuna (seriously), mussels, oysters, leeks, etc. In a big pan (I used a wok), melt the butter and cook the shallots until they’re translucent. Add the garlic and mix until fragrant. Mix in the white wine and bay leaf, and bring to a simmer. Add the mussels, and mix. Cover your pan for about 5 minutes to let the mussels steam. The mussels will be ready once their shells are open. Mussels with closed shells need to be discarded. Remove the mussels, and place them into a large bowl. With the remaining broth, add the cream and parsley, and bring to a boil – then simmer (for about 5 minutes). 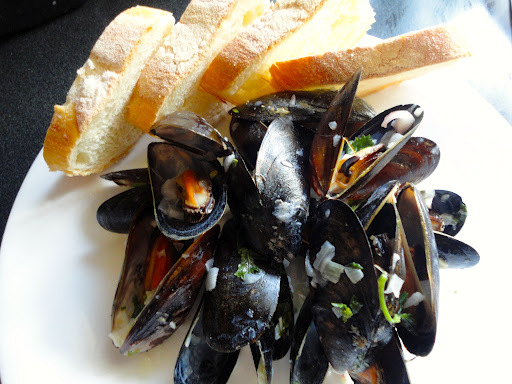 Serve the mussels with some of the broth, and crusty bread. Enjoy! Included in my haul of food were yellow zucchini, a tomato, and a lemon. I replicated a salad that was made in class for the gluten-free students. 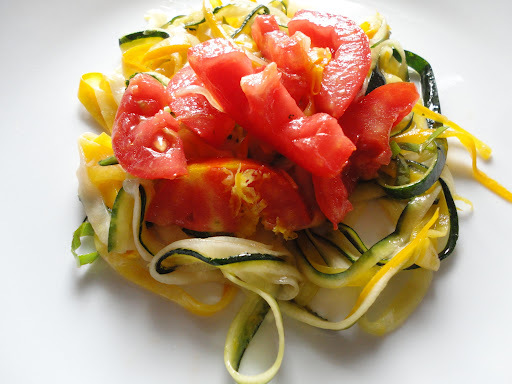 Before preparing the zucchini, mix together the tomatoes, basil, garlic, and olive oil – set aside. Using a vegetable peeler, peel the zucchini until you reach the seeds. 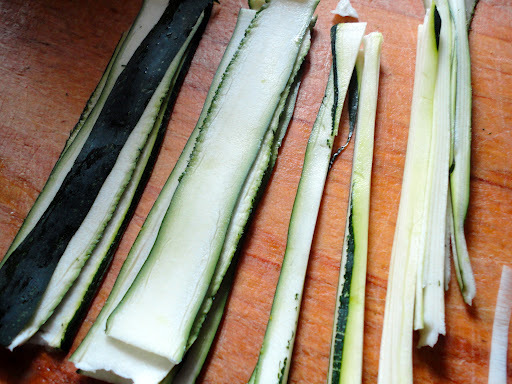 Using your chef’s knife, thinly slice the zucchini into fine strands resembling pasta. Place the zucchini into a colander (with a bowl of plate at the bottom) and sprinkle salt on the strands – so water draws out. Let it sit for about 15 minutes, then rinse.